I love mangoes! Tonight while shopping at Costco we discovered that they had a box of 9 for a decent price. Of course they are nothing like the mangoes I remember from Southeast Asia. Of course nothing beats fresh local produce for flavor. Here is an interesting fact about mangoes from Wikipedia. Apparently mango peel contains urushiol which is a chemical in poison ivy and poison sumac that can cause allergic reactions in people susceptible to it. During it’s primary season in Hawaii it is the most common source of plant dermatitis. 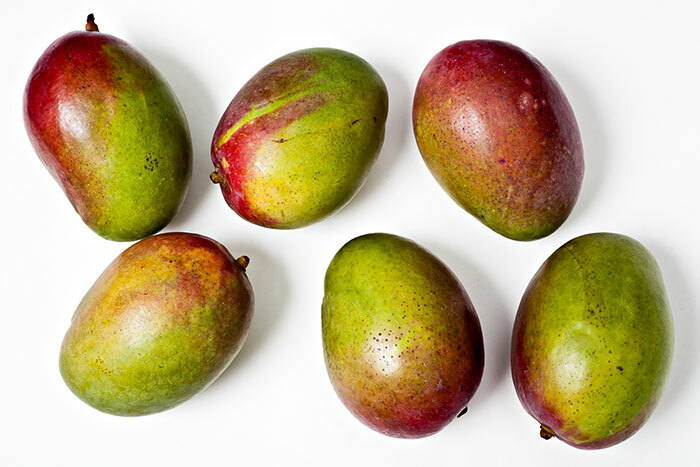 If you are allergic to poison ivy or poison oak you may want to give mango peels a pass. Tonight was a rushed shot. I used a Canon 580EXII in a shoot through umbrella camera left. To camera right I had a Canon 430EXII pointed straight up and bounced the light off the ceiling. This filled in the shadows a bit more and caused them to not add so much contrast. I’ve shot a mango before for Project 365 so this time I wanted to have multiple mangoes and shoot top down. I like the way the mangoes are positioned and the perspective. How about you? Does this shot work for you? What would you do differently?